In other words it is the role and responsibility of the individual believer. This being the most important aspect of this whole statement (blog series), it must be understood that I believe in the process and being part of it, being wise in stewarding your community, voting based on your convictions. As a pastor my job is not to tell anyone what to think, but to sharpen those believers who are under my care, challenging each of them to grow in wisdom, grace, and understanding of the word, which then would effect any participation in the political process. This is where it matters that we live for truth rather than carry truth around like a club, where it is of the utmost importance that we do not live like hypocrites, but walk in humility. If we actually live out the freedom and hope that is given us through the gospel we can let go of our fervent political ideology as a means to that freedom or hope. Then we are free to enter into discussion and thought about politics more practically and less emotionally. Then people can vote with wisdom and conviction based on what they understand to be biblical, without the need to tell everyone else how sinful or unintelligent, or worse, un-Christian they are for not voting like Jesus would have voted. It also disallows the assigning of one political party as more Jesus centered and keeps the election year free from needing to turn the pulpit into a series of sermons on the hot topics, and keeps the pulpit focused on the elevation of Jesus, not the United States’ political climate, as our central object of worship. In reality it transfers politics into one of the least aspects of who we are as believers and how we express our faith (unless of course you work/serve in the political arena) and puts us back on mission to live for Jesus consistently in every aspect of our lives, this is how impact is truly made. Every biblical example of a man standing for right and effecting change in a government leader or system is based in that individual living as set apart and in the case of Joseph (Genesis 39-45) and Daniel (Daniel) they were first taken into slavery and then in submission to those in authority over them and by living righteous and Godly lives, as well as using the gifts God gave them to serve (even those who held them captive) it was only then that they were able to effect change and offer counsel to the leaders. In the case of Paul before Felix and before Agrippa (Acts 23-26) it was more of the same, Paul was living out his calling as an Apostle and after being accused by the Jews he stood trial in defense of the Gospel, then he was able to share wisdom, which honestly Felix rejects and leaves Paul in jail. However even knowing that didn’t stop Paul from preaching. The final piece of this is John the Baptist before Herod the Tetrarch in which John had spoken out against Herod’s adultery, keeping in mind that Herod was a Jewish leader and subject to Jewish law (Matt 14:1-12, Mark 6:14-29) and John was calling him out on living outside of the law. To contrast this last example, we cannot hold a non-believing President or legislators to biblical standards and get hacked when they don’t “follow the Lord” by implementing policy we disagree with. I hope you can understand that this is not a position I take out of fear of offense, or out of lack of conviction, or certainly out of biblical ignorance, but as a pastor I understand my calling is to elevate Jesus, compel believers to draw close to Jesus, preach the gospel, and teach the full counsel of the bible. I am convinced it is more important for us to live as faithful, seek righteousness & holiness, love mercy & justice, and from that our lives then make impact. Believe me when I say I will preach like a lion in defense of God’s truth and certainly I hope you understand that I am willing to do whatever it takes to forward the gospel in a manner consistent with the biblical calling of a pastor/elder, however I see little kingdom value in using the pulpit to contest the political measures of a fallen world, endorse clearly secular political candidates, or in any way press people toward aligning any political ideology or party as more “Christian”, when I know that such contesting, endorsing, and pressing will not bring about change in men’s hearts, nor will it draw them closer to Jesus. I will continue to proclaim the gospel of Jesus Christ as our only hope, the only thing that brings lasting change to our sinful hearts, the only measure of righteousness, and our only means of salvation. So here it is… It’s my last official day as a thirty-something, and to be honest… it’s a bit odd. The day started pretty much like any other in the Pritchard household. We arose early and charged through our morning in a flurry of coffee, oatmeal, cereal, hair-brushing, and of course the required guidance from me… then I went on to deal with the kids. Totally kidding… I had already dealt with the kids :D… Please if anyone finds me broken and bleeding anywhere, I was beaten up by the most amazing and beautiful, and of course completely Godly woman ever! I digress… After getting my wife coffee and getting kids to school, I was off to Crossfit for one of the three weekly torture sessions I subject myself to there. I think that is where the day shifted for me. Perhaps it was the completely obvious difference in my physical ability or the aftermath of being caught looking like I was about to die after the workout, but somewhere in there I started thinking about turning 40 tomorrow (even typing that is just weird) and the lessons that I have learned in the last decade of my life, those slightly-less-than-roaring thirties (growling?) I am going to take a minute or 10 to list them out… some are deep, some are amusing (at least to me). 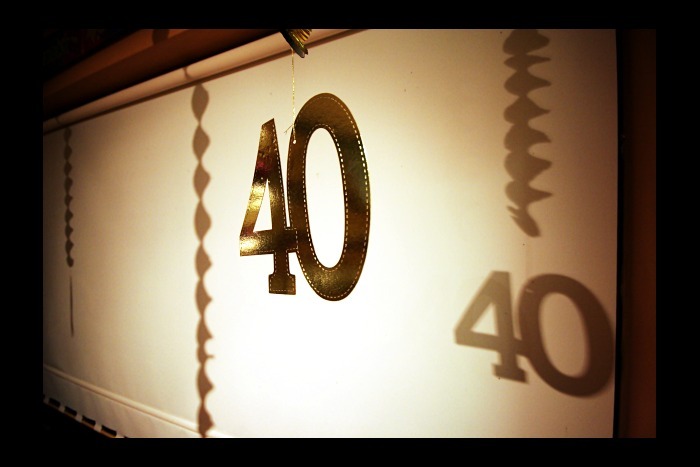 So if you have ever been curious as to what a guy thinks on the eve of his 40th birthday… or if you suffered a 40th birthday and were struck with senility (which I hear can happen) and can’t remember your thoughts… here are mine. Feel free to borrow. 1. The Gospel is the most important bit of information the world has ever received. 2. My wife is without doubt the coolest, most amazing, wonderful, hottest, best friend I’ve ever had. 3. Whew… I finally have an excuse for all this gray hair. 4. I can now admit I am not as quick as I used to be. 5. One can actually hang out with Jesus…it’s called abiding, and it rocks! 6. Where did this hair on my shoulders come from? 7. It’s never too late for a fresh start. 8. Is it too early to start anticipating how cool of a grandpa I’ll be? 10. All the things I thought I had to get accomplished by now… life is just as sweet, if not sweeter, without them. 11. That is actually a bald spot starting on the top of my head.. bummer. 12. Manhood is deeply important, and not as cliche as so many people think. 13. Do I really have to start wearing Dockers and polo shirts? 14. Christian sub-culture is weird. 15. Authenticity is definitely worth living by. 16. Humility is of incredible value, and is probably the central character trait of Jesus. 17. Standing on convictions can be costly, but in the end is always worth it. 18. My relationship with my Dr. is about to change dramatically. 19. At whatever age you are, you should be mentored and mentoring someone else. 20. The most significant thing a pastor can do aside from preaching the gospel… is raise people up to perpetuate ministry. That my friends is discipleship. 21. I have never been more thankful for friendship in my life, as I am at this point. 22. Community is not a buzz word… it’s a lifestyle. 24. The Bible… freaking awesome. 26. I can learn a lot from my children… especially my daughter, who loves to laugh. 27. I promise not to complain about weird ailments starting tomorrow. 28. I believe I am becoming the father I always wanted to have. 29. I actually like “dub step” thanks Gray, for introducing me. Do we really have enough? Do we really have all that we need? Lately I have been reading a pretty great book by a pastor from Florida named Tullian Tchividjian (chi-vee-jan) entitled “Jesus + Nothing = Everything” and I must say it’s a very good read. It points out the obvious struggle we have with really recognizing that Jesus is truly sufficient, or He is really enough. Truth be told this book probably struck me because of my own season, and of course that is why I’m writing about it now. The depth of the impact of the book though, that has come as a result of what God has been doing in my heart for the last few months. The question of enough-ness is a reality in this season and coming to a real and in depth grappling with the sufficiency of the Gospel has been a key part of the journey. The Gospel, the best news mankind has ever received, is so often thought of as a step on the road of the Christian, and that is really tragic, and a huge mistake. Why? Because in the Gospel is where we find enough! We want to find enough so badly we look everywhere for it. High and low, in every crevice, under every rock, and in every other place we think the world will offer it to us. The reality of this lifelong search is that we end up trying to get it from both “good” and “bad” things in our lives. The problem is that we are left depleted and longing for more, or searching for the next new thing that will be enough. We fill our lives with those things and it leads to an insidious form of idolatry that we can’t even recognize (especially when it’s the “good” stuff). That’s where we can end up. Trapped or enslaved to the things that we are desperately hoping will be enough. The things we hope will build our image, increase our significance, secure our identity or fill every void. Everything that, from the outside in, looks like we truly have enough, but in reality it is only keeping us addicted to those things all the while our hearts are burdened and longing for something real. Practically it may be the thing that keeps us in a mindset of putting others down to elevate ourselves, drives us to seek accolades and praise for the good acts we produce, leads us to craving a place to be needed or valued, or has us diving into relationship after relationship seeking comfort. We can seek the solution in religion, hopeful that it will lead to a sufficient filling of our need for enough, but in the end this is also a trap. Our acts of service lead to self righteous attitudes, our identities get wrapped up in what we do, our value tied to the “goodness” we portray. Think about it… that’s what is written about the good we try to do to fill the void, or just for the sake of being good. Freedom is found, or more importantly, enough is found in the Gospel. This is why it’s so desperately important that we NEVER think that we have matured beyond the Gospel, but instead we need to wrestle with it every day of our lives. When that happens there is freedom! Freedom to truly live, freedom to serve without need for praise, freedom to encourage without seeking affirmation, the list goes on and on and on. Imagine how we could live if we were truly finding enough in the Gospel, if we truly found satisfaction in the fact that while we were enemies of God, while we were far off, in the depth of our sin, when we were dead in our junk… at that point, God sent Jesus to die the death we deserved to give us the life we didn’t. If we consider that, or not just consider, but we give it significant weight each day, we really think about it, we could indeed find the enough that the Gospel has to offer each of us. My prayer for each of us is that we look for enough where enough can only truly be found.